Kingsmill are leading manufacturers of earthing materials and lightning protection. The product range includes copper earth bars, earthing tape, earth bars, conductors and air terminations. Earthing and lightning protection is required for to ensure buildings and infrastructure are not damaged by lighting strikes. If a building is unprotected and should be hit by lightning, there could be structural damage, fire and damage to the electrical systems or equipment. This can potentially endanger human life in addition to disrupting productivity and the normal functioning of the building in question. A lighting protection system is designed and installed to act as a shield to guard against lighting strikes and therefore protect the building and its occupants. In order for a lightning protection system to function properly, it must capture the lightning leading it down safely into the earth and then disperse the power within the ground. A building assessment can be carried to determine if a building needs a lightning protection system and its specific requirements. The components of a lightning protection system are manufactured from high purity copper or aluminium. It is vital that materials with low impedance are used to ensure the smooth and safe flowing of lightning energy into the ground. Air termination – The air termination is made up of vertical terminals and a lattice of conductors situated on the edge or roof of the structure to be protected. Down conductors – The down conductor is designed to provide the low impedance path for the lightning energy from the air termination down to the earth system. Earth termination – Down conductors must have their own earth electrode termination. in addition the resistance to earth of the whole system must not be greater than 10 Ohms. Earth terminations are most commonly copper rods driven into the ground with a minimum length of 9m for the whole system. Bonding – One of the most key elements of the lightning protection system is the bonding of metals to the building infrastructure. If other exposed metalwork such as drainpipes were not bonded to the lighting protection system this would create an alternative path for the lightning energy to flow down and cause damage and a potential side flash point causing severe damage. Video: EA Technology – Is Your Earthing And Lightning Protection System Up To Standard? A fully functioning earthing and lighting protection system is one of the easiest ways to safeguard your assets. Is your system up to standard? Kingsmill copper earth bars guarantee extremely high levels of protection and electrical safety for buildings and infrastructure. Copper earth bars provide a common earth point for electrical installations and are available with twin or single disconnecting links for testing the earth rod whilst disconnected from the lightning protection system. 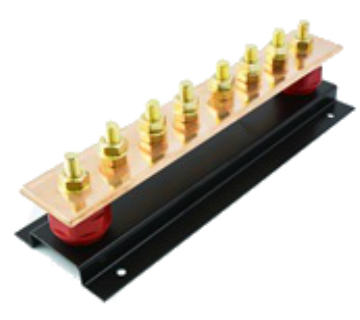 Each disconnecting link allows for easy isolation for testing purposes and are constructed from hard drawn copper bar. The range of Kingsmill copper earth bars are available from 6-30 way. T&D were established in 1985 and are now one of the largest Kingsmill earthing and lightning protection distributors and stockists – we provide expert technical support, competitive quotations and international delivery for the full range of Kingsmill earthing and lightning protection systems and products. Established 13 years ago, Kingsmill earthing are now one of the leading manufacturers of earthing and lightning protection products. T&D International are Main UK Distributors for Kingsmill Earthing And Lightning Protection Products.